Clearly, the task can become completely overwhelming. TrainingFolks understands these challenges and has an extensive track record in providing the tools and expertise needed to successfully navigate each stage of a project. More importantly, we have a reputation for doing so on time and on budget to allow you to minimize stress and focus on other priorities. While clients are extremely satisfied with our ability to effectively fulfill their corporate training needs, they tend to be most impressed with TrainingFolks’ ability to simplify the process and provide a complete end-to-end approach. We provide centralized administration for scheduling, billing and expenses, even for multi-region projects. This in itself greatly reduces coordination complexities for our clients and allows us to maintain a high degree of cost sensitivity. 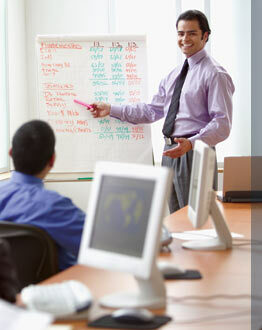 TrainingFolks has distinguished itself by delivering this true turnkey approach to training challenges. We provide flexible training design and delivery services to some of the world’s most successful global institutions. Let us assist in implementing change efficiently and smoothly within your organization.